Gurugram (Haryana) : President Pranab Mukherjee on Friday said India will develop only when the villages develop, adding that even today 68 percent of the population lives in villages. "Our villages not only have the capacity to develop but are also eager for development. If we keep moving ahead in this manner, the day is not far when our youth would not need to leave villages for cities in search of better avenues. Three new Pradhan Mantri Kaushal Kendras (PMKKs) at Mahendragarh, Ambala and Palwal were also inaugurated. 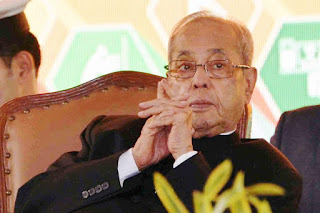 The President said that when the SMARTGRAM Initiative was started on July 2, 2016, he was sure that the work which has been done to make President's Estate a Smart Township can be replicated in villages as well. "With the help of Haryana Government, Rashtrapati Bhavan selected five villages and many initiatives were taken for their development. Keeping in view the success achieved in the five villages, the program has now been extended to 100 villages. Success in SMARTGRAM initiative is possible only when the Government, private sector, academic institutions, NGOs and people in the villages come together for the development of villages.," he added. Prof. Kaptan Singh Solanki, Governor of Haryana, Manohar Lal Khattar, Chief Minister of Haryana, Rao Inderjit Singh, MoS (IC) for Planning and Urban Development, Rajiv Pratap Rudy, MoS (IC) for Skill Development and Entrepreneurship, Dharmendra Pradhan, MoS (IC) for Petroleum and Natural Gas also addressed the gathering. Khattar announced that 1000 villages would now be made SMARTGRAMS. Secretary to the President Omita Paul gave a background of the SMARTGRAM initiative explaining how the programme has expanded since it was started last year. She said that she was convinced that if people work together, the SMARTGRAM initiative can be a tremendous success. On the occasion, certificates were distributed to students/trainees under various initiatives. Besides, MoUs were exchanged between Gram Panchayat Dhaula and NSDC & ONGC.